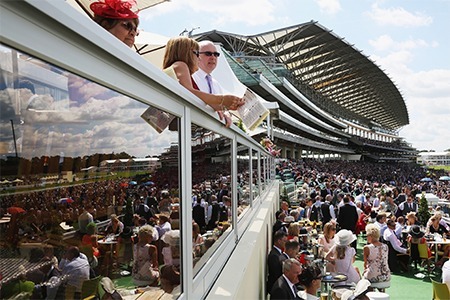 Eventmasters are proud to offer the finest Royal Ascot hospitality packages from within a delightful Furlong Club from Tuesday 18th – Saturday 22nd June 2019. We are pleased to announce that in 2019 we will once again be providing official Royal Ascot corporate hospitality packages as an Official Hospitality Supplier (OHS) appointed directly by Ascot Racecourse. With splendid panoramic views of the racing action, the Furlong Club is an ideal setting for any avid racegoer. The facility offers guests a wonderfully private and spacious environment close to the Bandstand and Parade Ring, and with impeccable table service on offer throughout the day, visitors will be sure to savour a splendid day at one of Britain’s most iconic sporting venues. Enjoy a day at the Royal Ascot meeting like never before with the fabulous Furlong Club. A delightfully exclusive setting complete with a private decked terrace and marquee, the Furlong Club is undoubtedly a must for the horse racing enthusiast. Guests can relish an alluring Champagne and canape reception on arrival before indulging in an exquisite four course luncheon and all-day complimentary bar stocking Champagne Ayala Brut Majeur amongst others. A delectable afternoon tea will also be provided later in the day complete with the finest Champagne Ayala Majeur Rosé. It will certainly be an occasion to savour. Located just a short stroll from the Parade Ring, Winners’ Enclosure and Bandstand.